MADRID — Rafael Nadal is sure Novak Djokovic will return to the highest level in tennis despite the Serb crashing out of the Madrid Open on Wednesday after defeat to Britain’s Kyle Edmund. Nadal’s defence of his title began in comfortable fashion as he coasted to a 6-3, 6-1 win over France’s Gael Monfils. But Djokovic endured another set-back, losing to world number 22 Edmund 6-3, 2-6, 6-3. Edmund had not taken a set off Djokovic in three previous meetings but the Serb is still feeling the effects of elbow surgery and his opponent took full advantage. It means Djokovic is left reviewing another early exit ahead of the French Open later this month. The 30-year-old has not gone past the quarter-finals of a Grand Slam since 2016. "I believe a lot in dynamics, in momentum," Nadal said. "Small things happen that normally when you’re in a good momentum, those things don’t happen. When you don’t have that momentum, you’re in a negative way, these things happen. 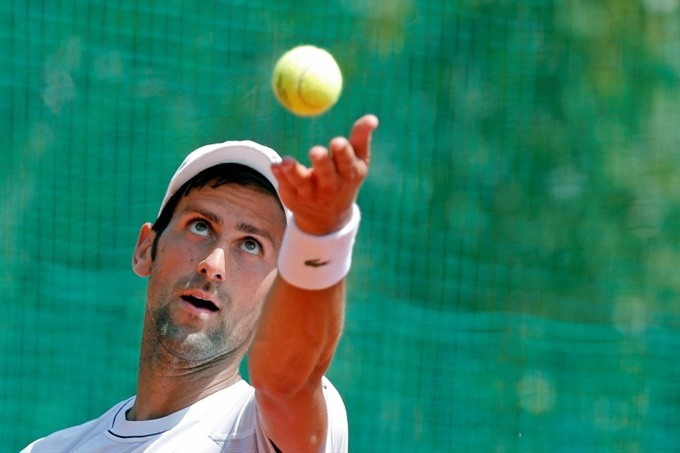 "I think Novak, step-by-step, is going to be able to recover and be at the level he deserves. I don’t have any doubt he’s going to be back up at the highest leve". Djokovic stormed through the second set on the Manolo Santana court and, at his best, might never have looked back, but he spurned three break points early in the decider and Edmund pounced. This was only the third time Edmund had beaten a player ranked as high as world number 12 and in terms of status, Djokovic is by far his biggest scalp yet. "Kyle was just better in the decisive moments and I was a bit unlucky," Djokovic said afterwards. "Definitely Kyle is playing the best tennis of his life." Edmund’s barnstorming forehand wreaked havoc throughout and it was no surprise when the winners tally showed the Briton 30-11 ahead by the time Djokovic sent a final backhand long. Belgium’s David Goffin, whom Edmund lost to on clay during Britain’s run to Davis Cup glory in 2015, now awaits in the last 16. "It’s not the end of the world," Djokovic said. "Obviously, I’ve played this sport for so many years and had a bunch of success. I try to always remind myself and be grateful for that. "At the same time, nobody is forcing me to play this sport. I do it because I like it. That’s where I draw my strength." Nadal has enjoyed his own resurgence over the past 12 months, having reclaimed the world number one spot and clinched two more major titles. His latest win over Monfils was never in doubt and the Spaniard has now won 20 matches and 48 sets in a row on clay. A clear favourite to claim his 11th title at Roland Garros, Nadal will now face Diego Schwartzman of Argentina in the last 16. "I have done a lot of things well since I came back," Nadal said. "I play with the right intensity, the right focus all the time. My backhand is working great. The forehand is working well too, as always. "What I am most pleased with is I am recovered from injury and that makes me feel strong and confident I can survive tough matches." In the women’s tournament, Maria Sharapova reached the quarter-finals with an impressive 6-3, 6-4 demolition of France’s Kristina Mladenovic. Former world number one and five-time major winner Sharapova fired 30 winners and nine aces in her victory which gave her a last-eight clash with Kiki Bertens. Dutchwoman Bertens stunned world number two Caroline Wozniacki 6-2 6-2. World number one and top seed Simona Halep had earlier maintained her charge towards a third consecutive Madrid title as she eased past Kristyna Pliskova 6-1, 6-4.